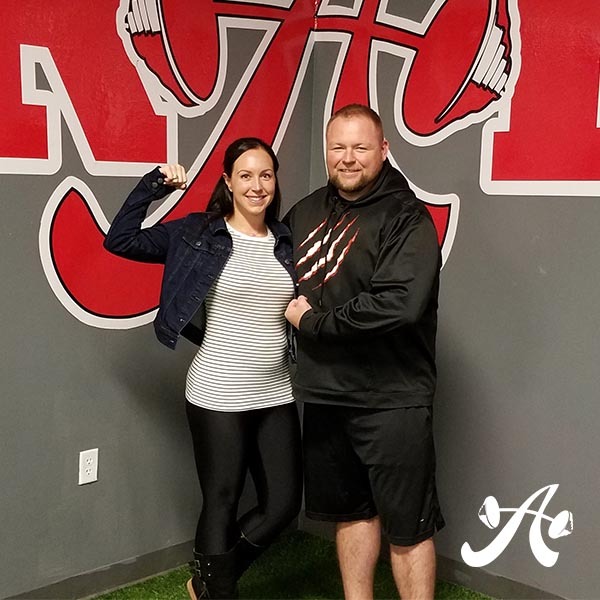 Coach Mark named Kelli Athlete of the Month for Austin Simply Fit Leander because she has made huge progress through consistent, smart and hard work. Most importantly, she has found training to be enjoyable! What do you do for work/ in your professional life? I’ve been in medical sales for 7 years. Currently, I sell enteral feeding pumps for a manufacturer. How long have you been working out at ASF? I needed a change of pace. I was with another gym and trainer for 9 months prior and everything hurt. Mark really caught my attention with RPR and I liked the concept of quality over quantity with 30 minute sessions. To reverse the pain in my shoulders, hips, and knees. And unbroken strict pull ups! I can honestly say, since training with Mark I have not had any “pain”, other than being insanely sore at times. My knee pain, as a result of genetics and an underdeveloped VMO, is gone for the first time in my life. I can do a couple of pull ups, but my goal is 10, so we are still working on my back. It has come a LONG way and I couldn’t be happier with the progress! I can’t tell you how many times I’ve thought, I wish I would have started here sooner. Training with Mark at ASF has rejuvenated my passion for lifting and getting stronger. I am happier and more optimistic which positively impacts my entire life. What challenges have you had to overcome, if any, since starting out at ASF? The “I cant attitude”. I didn’t grow up an athlete so I’ve never had a coach challenge me mentally by pushing me to do things I’ve never tried. Mark has been patient and persistent to help change, “I can’t” to “ok I’ll try”. Any surprises since starting at ASF? That I can actually do a box jump without knee pain!! Why do you like working out with Mark? I think our personalities for training just click. He’s motivating without being too wordy. Which is great for me when I am physically challenged and sucking wind! He has taught me so much by explaining why and how we do things. What is it about mark/ASF that keeps you coming back? I love the challenge and change up. I love not knowing what to expect. It’s a different combination every session. And I love what it’s done for my overall health and strength! What are your goals & plans for the future at ASF? My goal is to continue making training a priority no matter what the season of life. Anything else you’d like to add about your experience at ASF or with Mark?